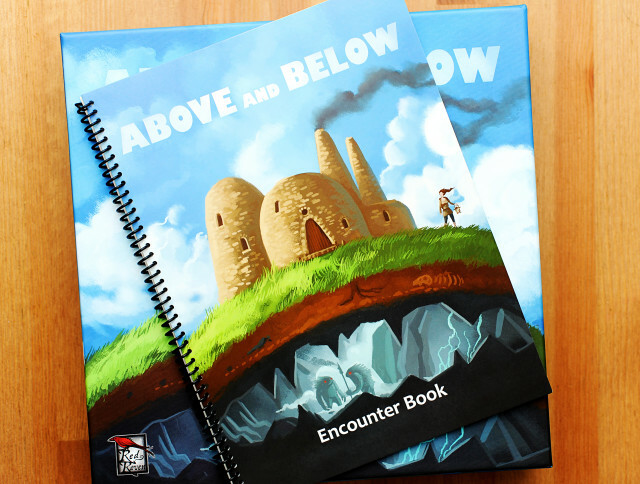 I’d heard quite a bit of buzz about Above and Below before I tried it at BGGcon. I then saw it a couple of times being played in the main hall, and was even more intrigued. On top of the “it’s a storytelling game, sort of!” with the wonderful spread of art I was seeing, I was keen to get it to the table. I got to play it 3p with my pals Kyle and Eric and it was really wonderful and had a nice familiar yet new kinda feel to it. Not strictly a ‘storytelling’ game, and not quite a dungeon crawl, it’s more of a “we’re new here, our villagers are up to stuff, exploring and expanding our village” crawl. There are a lot of things going on in the game, and if you balance them out nicely you can have a tidy victory at the end. 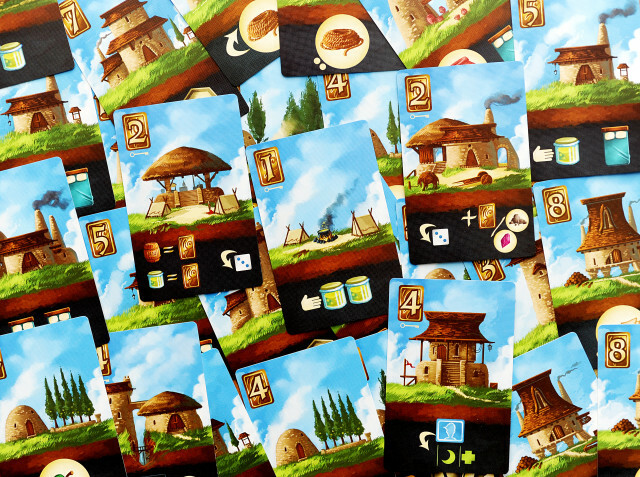 Over 7 rounds, there’s a delicate balance to aim for: getting some buildings out for their benefits and possible points, making sure you have a variety of skills in your population that will help with actions, especially your ability to explore. So, how does one crawl through this fun game? Over 7 rounds, you use your villagers to perform actions. Action selections can be limited by the amount of people in your village (rested up, mind you!) or the resources you have available. But you can explore, work on your resource advancement track, build above or below (oh, yeah! ), train up new people in your village or do a little work for cider or money. Exploring and building are probably the most prominent actions to take in the game – the money/resources etc you may get from exploring, as well as the cave space discovered, really feeds into and relies on the buildings you choose to put into your village. First, you have to have some folks in your new village to get things going. 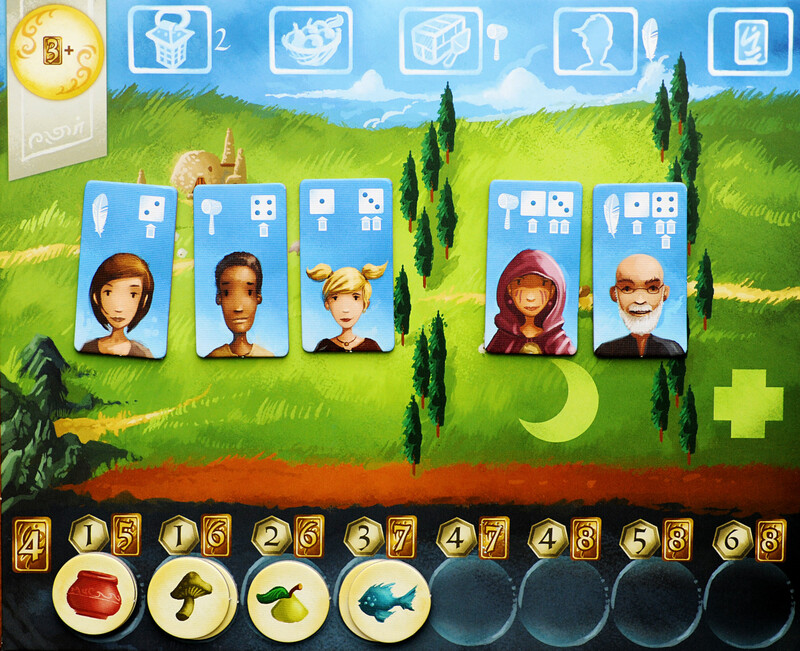 You start with three villagers with a variety of skills so you are able to explore, build and train other villagers from the get-go. When you train a new villager, you want to think about the strategies they can aid you with and the actions they’ll be most useful for; each character has certain dice values, lanterns to determine how helpful they are in adventuring, and possibly a symbol to indicate they can build, or train villagers. Every person in your village can be part of an adventurer’s party, but the benefits they’ll bring vary – how many lanterns can they put towards certain choices in an adventure (and what is the likelihood the dice will be in your favour for that? ), or are they more helpful with building, or training up more new people? And don’t forget to make sure you’ve built up enough beds to let these weary folks sleep! They’re working hard to explore and build your fantastic little town. So let’s look at those tiring options, shall we? Buildings offer a strong foundation – yes, I went there – to the other things you’ll be doing in the game – bonuses that will allow you to build more, potions to heal if you’ve explored too much, and much needed rest spaces for your villagers. Adding to your above-ground village, you can build from a pile of ‘house’ cards, which can offer a variety of benefits: rerolls, extra beds to rest your villagers, a little extra income, potions, resources and the like. Later, you may be able to afford some ‘key’ house cards, which will help for end-game points (either straight up, points for resources/buildings/villagers, etc!). Below-ground cards – or ‘outpost’ buildings – offer various immediate benefits (beds, income, resources to harvest etc) as well as often being combined with game-end points (again, straight-up points, or cumulative based on points per object/item/etc). Exploring is where the ‘storytelling’/choose your own adventure type aspect comes into the game. Taking at least two villagers with you, you roll a die to see what/who you encounter, and make decisions based on the initial information, plus how difficult (dice rolling based on villager’s abilities) your choices are. There is always a low difficulty option to take, but it’s never going to pay out in goods, money or reputation as well as a higher difficulty choice. Exploring provides you the only way to gain/lose reputation, which can offer points at the end of the game depending how you did – and unfortunately, this can be pretty unpredictable when you’re trying to decide the path to take in your adventure (either because you didn’t quite guess where you’d be doing good/bad correctly, or you failed your dice rolls). Exploring also offers you cave cards in which outpost buildings can be constructed, and more often than not you may also gain money, potions, resources. 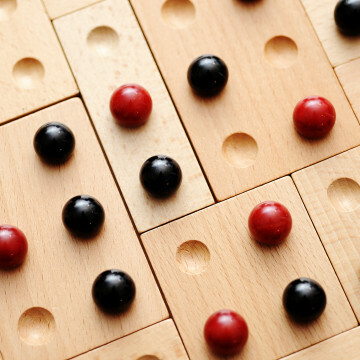 Tied to building and exploring is the resource track that can be a real boon of game end points when you’re smart about it. By exploring and gaining random resources, or harvesting resources from buildings as an action, you take resources from buildings in your village and place them on the progress track. The availability of the resources is variable, and as you progress up the track, each good is worth more and more points per token in its pile. Managing this is a little tough – do you throw out your goods in any order to up your income quickly, or try to curate the track for maximum payout on more available resources for the end of the game? For me, this is one of the hardest things to work at and not pile everything into. A delicate hand is needed with this. 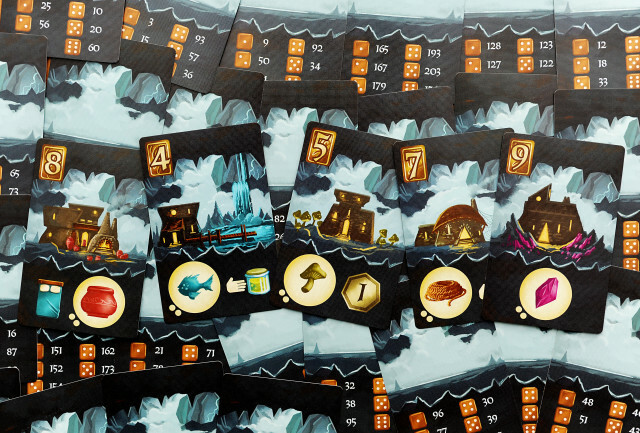 While most of the game is fairly straight up – taking actions, managing your money and villagers – the exploring part of the can have quite an unknown factor, and dice rolling randomness that can be hard (but not impossible if you snag some reroll buildings!) to mitigate. However, the flavour of the text is interesting – strange creatures and characters for you adventurers to encounter, different choices are provided depending on the difficulty of skill rolls, and it really does have the feel of a mini choose-your-own-adventure. You have to hazard a guess at whether helping someone or harming them will be of greater benefit, or if fighting or fleeing will be the better choice. So yeah, this gives the adventuring action a nice storytelling feel, but you may end up not getting the bounty you’d hoped for – and worse, even if you try to choose the “right” thing to do, you could end up bumped down on the reputation track because you pissed off the wrong person/monster/grumpy magical tree. If you okay with letting a game play you a little bit, while having more control over the rest of it, Above and Below will be a great experience for you. 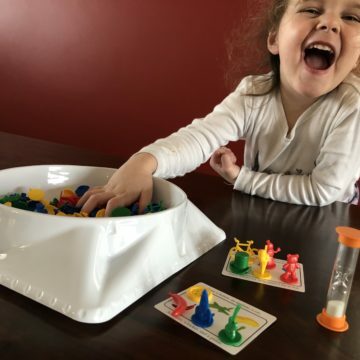 The idea behind this game, and the way it plays have not been something I’ve encountered in this sort of unique mix before. Once learning, you’ll find that the actual gameplay is fairly straightforward, with you just making sure you balance out your actions, buildings, resources and the like through to the end of 7 rounds. It may well leave you yearning for a bit more RPG, or seeking out some action selection/worker placement-ish games and then coming back to it for a nice big mix of it all.